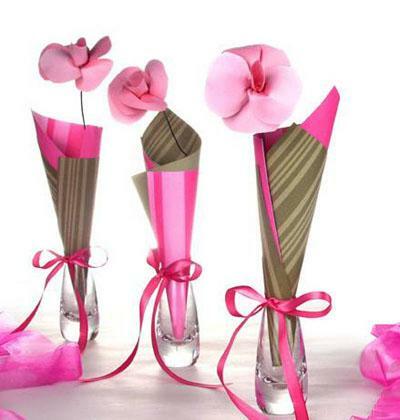 Crafty handmade flowers make lovely party decorations. If the economic forecast has you in search of a way to relieve stress, you may find yourself looking for easy and cheap crafts to complete. While many people assume crafting is an expensive hobby, Kathy Peterson has made it her mission to prove you don't need to spend a lot of cash to create unique and beautiful projects. Craft for Health is Kathy Peterson's newest project. A joint venture with nurse practitioner Barb Dehn, this unique site explores how expressing yourself through craft projects can enhance both your mental and physical well-being. Recently, Kathy Peterson spoke to LoveToKnow Crafts about the many ways crafting can enrich our lives. What types of crafts do you enjoy? I enjoy just about every kind of craft project - from painting and sketching to sewing, paper arts, and card making. My crafting style is very eclectic with a touch of whimsy. I use a lot of bright, happy colors in my craft projects. Colors make me happy and bring smiles to others as well. 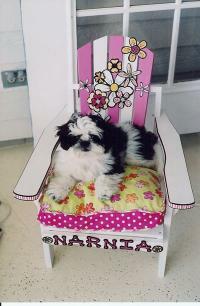 Paint and fabric can turn an ordinary piece of furniture into a real style statement. What are some ways crafters can use their talents to perk up their home environment without spending a lot of extra money? Go on a treasure hunt in your own home. Recycle what you already have with a fresh coat of paint. Jazz up on old dresser with some paint, fabric, or sophisticated rub-on home décor stickers. Dig into your fabric or linen stash to create some new pillows or cover an old lamp shade. Frame your children's artwork. Kids make great artists because they're not afraid to express themselves. I have one friend that has used her children's art to decorate her home. It's a very fun way to decorate. What are some of your favorite ideas for making handmade gifts for friends and family? I love making handmade cards. People seem to really appreciate the fact that I cared enough about them to send them a handmade card or invitation. I also like to be really creative with gift wrapping by sewing a fabric bag and personalizing it with a monogram and some fancy ribbon. In a recession, spending on hobbies such as crafting is often the first area people cut in order to balance their budgets. What are your best tips for saving money on craft supplies? Use your paper scraps and dig around your craft supplies. You might be surprised with what you'll find that you stashed away last year. Be creative with buttons, lace, trims, ribbon, etc. You can use them to make jewelry, home décor accessories, or embellish clothing. Mix up some leftover paints to create a new color and extend the life of the paint. If you love scrapbooking, consider digital scrapbooking. Many freebies are available online. What inspired you to create the "Craft for Health" Web site? Can't afford a new outfit? 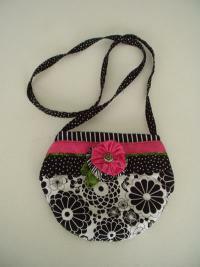 Sew yourself a fashionable purse to add interest to your wardrobe! I've always enjoyed inspiring others through crafting and using crafting as my own stress reliever. With the economy the way it is, it's so important to take good care of yourself. Crafting is very therapeutic. I contacted my dear friend Barb Dehn, a nurse practitioner, and asked her if she'd like to help me launch the site. Together we'll be offering inspiring craft therapy tips, craft ideas, and thoughtful anecdotes from crafts, artists, designers, florists, decorators, mothers, caretakers, and ordinary people who use crafting as a form of therapy. In what ways can making easy and cheap crafts be a good stress reliever for people coping with economic uncertainty? Crafting is a great stress reliever. By making something handmade, you can change your mood. If you're overwhelmed with financial difficulties, making a craft project can help you step outside yourself and free your mind from troubling times. Knitting, for example, requires a repetitive motion and can help you focus on the task rather than your pain. You can accomplish a feeling of fulfillment when you finish a craft project, whether you sew a pillow cover, doodle some scribbles, or paint a flower pot. It's truly a feeling of empowerment. Crafting is great therapy. It can also help bridge difficult conversations with elderly parents, tweens, etc. Crafting is entirely positive, even if you make a mistake. Mistakes can be easily fixed or used to make the project more interesting. Some of my biggest craft mistakes have ended up being some of my best designs.